Inline mini grinder, right angle mini grinders, pistol grip grinder, high speed grinders, low speed grinders, air grinders, pneumatic grinders, die grinders, angle die grinders, and angle grinders. These grinders all have 1/4" collets. Additional right angle grinders are shown on our Threaded spindle grinders page. 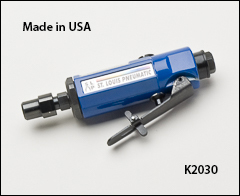 St. Louis Pneumatic small size enhances the ability to grind in confined or hard to reach areas with carbide rotary burs or with mounted stones. Rear exhaust. Lower prices are available for 10 and 25 tool orders of this grinder. 1/4" collet, 3 CFM @ 90 PSI, 1/4" air inlet, 3/8" min hose, 5.75" long, 0.875 lbs. St. Louis Pneumatic uniquely designed grinder with an alternate grinding angle is great for use with carbide rotary burs or surface preparation discs. Rear exhaust performance. Comes with safety throttle lever and 2 wrenches. 1/4" collet, 3 CFM @ 90 PSI, 1/4" air inlet, 3/8" min hose size, 7.25" long, 1 lb. 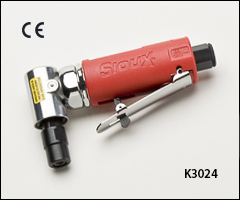 St. Louis Pneumatic compact design works great in confined spaces. 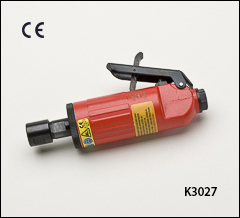 K2038 is used for your low speed, high torque applications. Both have rear exhaust and safety throttle levers. Lower prices available for 10 and 25 tool orders. 1/4" collet, 3 CFM @ 90 PSI, 1/4" air inlet, 3/8" min. hose, K2035: 6" long, 1 lb. Sioux Force grinders have lockoff lever throttles for safety, a built-in speed regulator, and aluminum housing with comfortable insulating grip area. 1/4" collet, 4 or 4.5 CFM, 90 PSI, 1/4" air inlet, 3/8" min, K3024: 6" long, 1 lb. 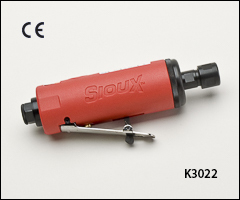 Sioux Signature Series 0.30 HP, heavy-duty, high power to weight ratio. A tough steel angle head, lever throttle with built-in speed control, and rear exhaust. 1/4" collet, 11 CFM @ 90 PSI, 1/4" air inlet, 3/8" min hose size, 6" long, 1.2 lbs. 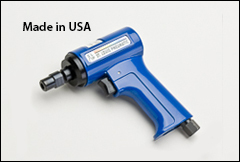 St. Louis Pneumatic 1.8 pounds comfortable pistol grip for alternative grinding angles. Lower prices available for 10 and 25 tool orders of this or other St. Louis tools. 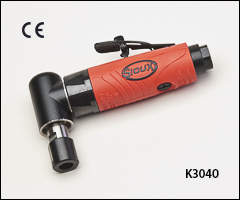 Sioux Force lockoff lever throttle, a built-in speed regulator, comfortable grip, and aluminum housing. 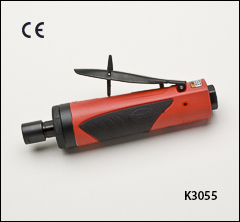 K3020 is 5.3" long, 0.08 lbs. K3022 is 6.5" long, 1.3 lbs. 1/4" collet, 4 CFM, 90 PSI, 1/4" air inlet, 3/8" min hose, K3020: 5.3" long, 0.08 lb. St. Louis Pneumatic mid-sized die grinders equipped with a safety throttle lever. Lower prices available for 10 and 25 tool orders for all items listed below. 1/4" collet, 3 or 4 CFM @ 90 PSI, 1/4" air inlet, 3/8" hose, K2010 is 7" long, 1.5 lbs. 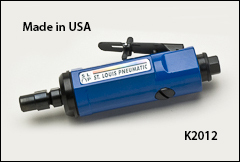 St. Louis Pneumatic low speed grinder for your applications requiring high torque. Safety throttle lever. Lower prices available for 10 and 25 tool orders. 1/4" collet, 4 CFM @ 90 PSI, 1/4" air inlet, 3/8" min hose size, 8.625" long, 2 lbs. Sioux Signature Series mid-size heavy-duty with durable powder coat finish. Features include lockoff lever, ball bearing construction, built-in air regulator, fine wire mesh inlet screen, steel inlet bushing and heavy-duty 3 piece double tapered collet. 1/4" collet, 25 SCFM @ 90 PSI, 1/4" air inlet, 3/8" hose, 6" long, 1.2 lbs, 82 dB(A). Sioux Signature Series proven air motor, no burnouts. Precision spaced rotor guarantees longer motor life. Precision ball bearings provide collet support and more accuracy. 1/4" collet, 30 SCFM, 90 PSI, 1/4" air inlet, 3/8" hose, 7.5" long, 1.6 lbs, 77.7 dB(A).